The many varieties of jasmine vines are as prized for their delicate flowers and glossy leaves as they are for their gorgeous fragrance. Making them even more attractive is the ease of care. Jasmine vines thrive almost anywhere and it takes very little effort to keep them healthy. The hardest thing about caring for jasmine vines is keeping them under control, as they can smother trees and smaller plants if you let them get wild. Keep your jasmine vine moist, but not soaked. They prefer full sun, so it's important not to let them dry out. Poke your finger into the soil. If it is not moist for at least the first inch, it is too dry. Water your vine less as the weather cools and winter approaches, but don't let it get too dry. 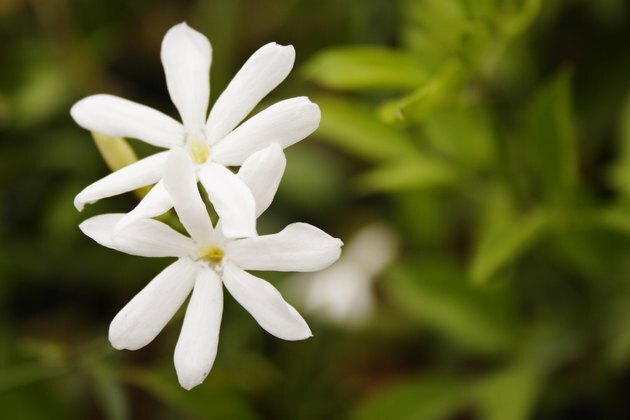 Fertilize your jasmine vine with an acidic, water-soluble fertilizer every two weeks during its growing season, which is usually in the spring. Read the label for the proper dilution because each brand of fertilizer is different. Prune your jasmine vine in late winter, just before its growing season starts. Don't be afraid to cut it back hard; that will encourage new growth. You can also pinch dead blossoms off of your vine in the mornings during the spring and summer to keep it healthy and lush. Cut shoots that are growing vertically back to the horizontal, unless you are training vines to climb. Climbing vines need to be pruned back to one-third of their fullness, to keep them from becoming top-heavy. You can do this by removing stems where they grow out of the base. Always cut off all deadwood, so that pests can't feed on it. Check your vines for aphids and other pests. If you see any sign of infestation, spray your vines with insecticidal soap. If your vines are planted in containers, isolate them from other plants so the pests will not spread. Train climbing vines by stapling a plastic zip tie to a wall or trellis and looping it loosely around your vine. Make sure you keep them well-pruned as they grow, because they can get heavy enough to topple small supports.